Every aspect of the new $55.00 Omega powered trickler (from Dandy Products LLC) shows smart thinking. First, hopper height can be adjusted from 1/2″ to 5.5″ high. The tube is long enough to reach the middle of large-footprint scales such as the Denver Instrument MXX-123. And the outer end of the tube is cut at an angle, so you can see the powder kernels as they flow out — no more surprise clumps that raise your charge 0.2 grains. The powder hopper itself is bigger than most, holding a full 1000 grains. That lets you load all afternoon without having to constantly replenish your trickler. In practice, the Omega trickler is easy to use. It is reasonably fast, while being as precise as anything on the market. The unit is controlled by a two-button control pad, with a black button for slow feed and red button for fast feed. You can use the fast button to load the bulk of reloading powder and then use the slow button to maximize the accuracy of your load. The control pad is connected to the dispenser by a 24″ cable. That two-foot cable run allows plenty of trickler placement options on your bench. 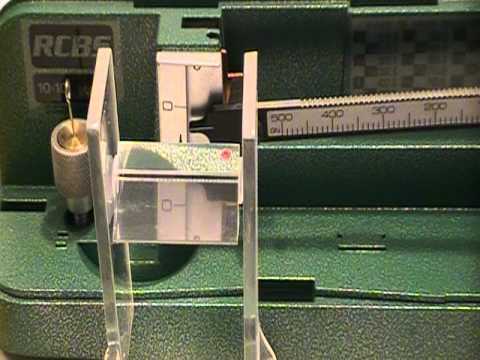 Watch the video below to see the Omega Trickler in use. For reloders using balance-beam scales, Omega offers a clever portable prism that makes it much easier to see the tip of the balance beam, when the scale is on the benchtop. Omega’s Handy View accessory mounts a prism in a plastic stand. The prism changes the sightline so you can easily monitor the beam tip without having to bend down to see the beam alignment marks. The prism slides up/down and swivels (around horizontal axis) to allow adjustment of viewing angle. It is a simple set-up, but it really works, allowing you to monitor scale beam movement with greater precision (and less neck strain). The Handy View costs $17.95, and is offered with either a yellow stand or clear plastic stand. You can see how the Handy View works in the video below. 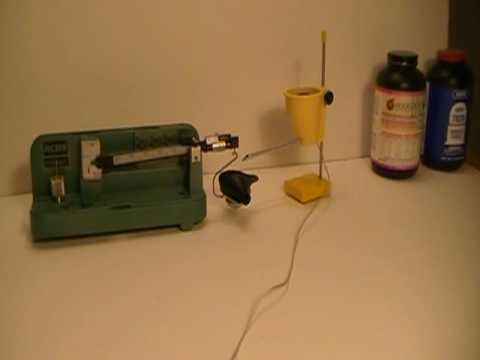 Share the post "New Omega 2-Speed Powered Powder Trickler"